Our bird feeder has very easily provided us with countless hours of entertainment. Between the birds and the squirrels trying to read the seeds there has been many oohs and ahs. With just a few tweaks to our bird watching station, I was able to bring in a little literacy, science and math to our birding adventures. These small additions changed it from a form of entertainment to an educational activity that works for kids of all ages. Why watch birds? It is a simple and fun way to learn about the world around you. Affiliate links. Use reference materials to identify species. How to Set Up the Feeder for the Educational Bird Watching Station. The best placement for your bird feeder is more than 10 feet (15 feet is better) from any tree branch, house or other structure. Low bushes provide birds a cover and protection. 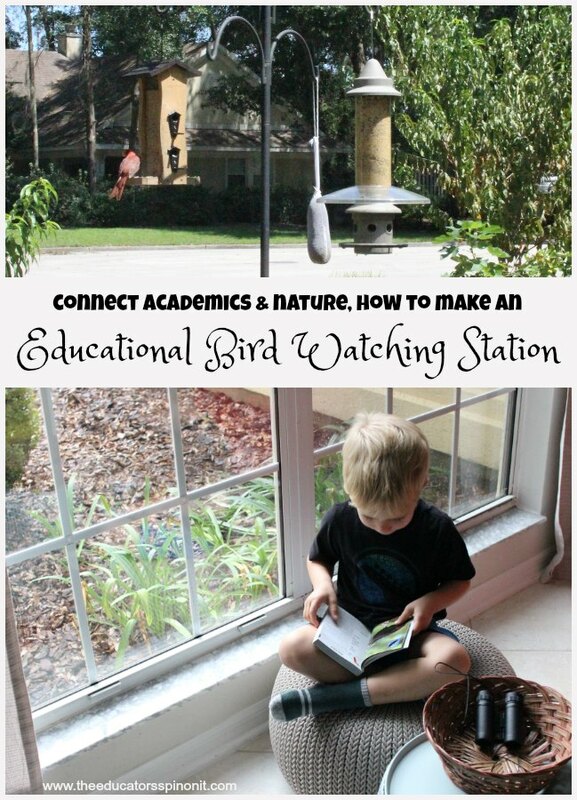 Place it within view of the window so kids can view the bird watching station from inside. First, and most important, every bird watching station needs a bird feeder. We have tried several kinds. The simple wooden feeders are my favorite style, but the squirrels take a flying leap from our roof (10 feet away) and occasionally land on the platform. They have nearly destroyed the wood on the platform that holds the seeds. The Squirrel Buster Wild Bird Feeder on the other hand, is very expensive. Just be warned. BUT, it is so worth the investment.We save lots of money on seeds and replacement bird feeders. We use a mix of seeds, heavy on the sunflower seeds because we often have cardinals visit. If you truly enjoy bird watching, then this is the feeder for you. We loved it so much that we bought one for both my parents and my in-laws one Christmas. They all have raved about how wonderful it is (so it’s not just me.) Ours does have the weather guard, which is sold separately. We also had a wire suet feeder, but the squirrels literally RAN AWAY with it this week. My parents use a large clip to hold theirs on, which is what we are going to resort to – once we get another one. Every bird feeder needs some place to hang. We use the squirrel baffle pole to hold up our feeders. It’s one more way to combat the squirrels getting up to the feeders from the pole. My kids think its silly to see them climb up and try to get around it. We have not seen a squirrel successfully climb over the baffle in the 4 years we have had the pole. Set your feeder 15 feet from a tree or roof area if possible. This will also reduce the amount of squirrels. Consider adding a place for birds to bath and drink. We have a pedestal bird bath that was around $30. It’s light weight, holds water, and has held up ok. I did splurge and add in a solar fountain. Right now, I’m not super impressed. It floats around even when I’ve tried to anchor it with rocks and only works in direct sunlight. Totally not needed, but fun and a great springboard to discuss renewable energy options with your children. Purchase a bird identification guide for your area. 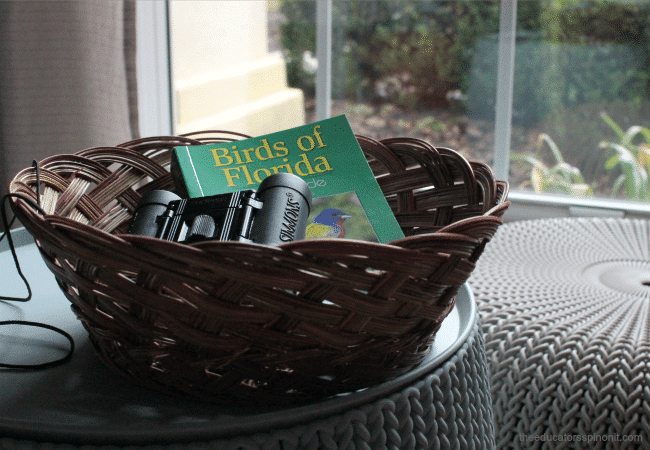 First, purchase and add a bird guide to your bird watching station. You can check a few out from the library to see which one you like the best, but it is worth the investment to own one. Many of these guides are not written and published for children, rather bird watchers of all ages. Once you have purchased them, teach your kids how to use one based on how your specific book is organized. Learning to use a reference material is an important academic skill. Demonstrate how to find the size of the bird. The difference between the male and female and other features that can be helpful in identifying birds. Adding this book will bring literacy (written text), math (size, number of eggs, days of incubation), science (comparison, adaptations, diet, migration patterns) and geography (map). Learning to use a reference material is an important academic skill. Include a set of binoculars for an up close look. We have tried the inexpensive plastic binoculars like this one. They really didn’t work well and broke soon after we received them. We’ve also tried the kid binoculars. They are much easier for little hands to manage. My parents gave us their old binoculars and the kids seem to enjoy using “real” tools. We have helped them to learn how to focus for a clear picture. Place in a basket or other container along with the book. You would be surprised at how often the kids use it to help them figure out what bird is on the feeder. My children use the ruler most often to figure out which woodpecker comes to eat. They are all similar in colors and markings. The Downy Woodpecker is 6 inches and the Hairy is 9 inches. I love looking over and seeing one of the kids holding up their ruler trying to decide which one it is! A notepad or other journal may encourage kids to write down their observations. I like to rotate between a plain notepad and an educational prompt, such as observe the feeder for 15 minutes. Record the number of birds you see every 5 minutes. Or a tally chart with some of the most common birds to frequent our feeders. In the spring, you may also encourage the whole family to participate in the annual backyard bird count. Kids need a place to sit. Last, but not least, kids need a place to rest and observe. You may put some pillows on the floor, let them sit on kid chairs, or have a sofa nearby to lounge and observe. We have a set of poofs that came with a little table, making it the perfect set to have near the window. This kid friendly seating also doubles as a pretend café as it is next to our pretend kitchen area. Having a place for children to sit invites them to observe more often. Visit the library and check out books on specific birds or birding stories. Visit a local zoo and focus your visit on their aviary. Watch a video or live webcam with a bird. Talk with a zoologist or other bird keeper about the diet and enrichment of birds in captivity. Visit a local pet store. Ask questions about the birds. Compare the birds at the pet store with the birds in your backyard. How are the birds similar and different. 10 Reasons Why I Love Teaching My Kids About the Earth. Great! Thanks for the link Mia. What a fantastic post. I love the tips and I am going to pass it over to the RSPB who I have been working with on the First Birds App for Kids on. That’s awesome – thanks. We spend at least 10 minutes every day watching our birds. They are a great source of education and entertainment.